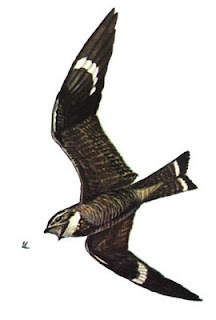 My father, a non-birder who grew up in Minneapolis in the 1950s and 60s, remembers that the sky used to be filled with Common Nighthawks. A species needs to be pretty numerous for non-birders to take notice. That's changed though and numbers of Common Nighthawks are in steep decline. They simply aren't as common as they used to be. Hopefully you can help with that. Sami Nichols at the University of Minnesota is undertaking a project to monitor nighthawks populations and hopefully identify acting nesting sites. The data she gathers can hopefully aid policy and conservation decisions to help this species regain numbers. You can help by reporting nighthawks you see. Please download the instructions and reporting forms and start looking for nighthawks! Hi Kirk -- Great suggestion. I didn't know nighthawks were on the decline.